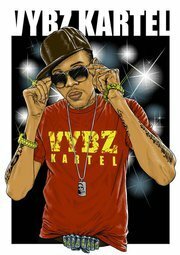 iDancehallReggae.com::Caribbean Lifestyle Media::: Vybz Kartel To Do A Reality TV Show? Vybz Kartel To Do A Reality TV Show? Caribbean Lifestyle Media: In all the mayhem that is Vybz Kartel; the loss of business partner Corey Todd, loss of members of the empire, and loss of melanin. Kartel has plans to continue to dominate the media and is focused on branding himself using his "Gaza" brand. Kartel's recent interview with Rolling Stones Magazine brings home the point that even without a visa, he is able to garner attention from the US mainstream media. Yeah!, I am aware that Kartel is releasing a book and social commentary is hardly anything new. However, the more interesting news is that Vybz Kartel is gearing up to do something that is a first for any Dancehall artist. He will be doing a Reality Show to air on Jamaican Television in the fall. Who knows? Maybe Vybz Kartel's show will get picked up by VH1. Kartel told Rolling Stones, "this will be another first for dancehall music: a reality show similar to Flavor of Love. Twenty girls from all over the world, vying for the quote-unquote love of Vybz Kartel, vying for my heart. Wherever that is."